My name is dk, CEO of Purpose Inc. John has very graciously allowed me to share my Facebook Advertising Presentation from Affiliate Summit with his readers. When I speak, people repeatedly ask for actual case studies. 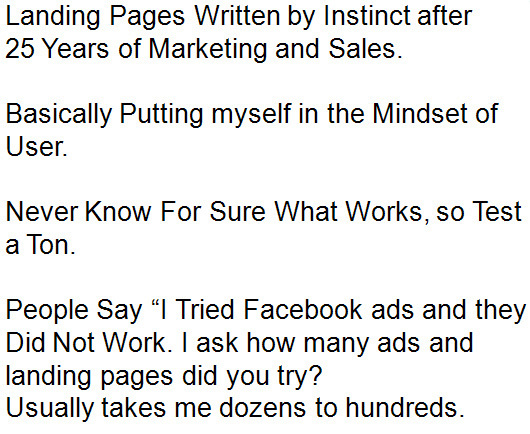 The week before Affiliate Summit, in four days, I did the following test. I spent about 4 hours on it, and one of my programmers put in probably about the same amount of time making landing pages. 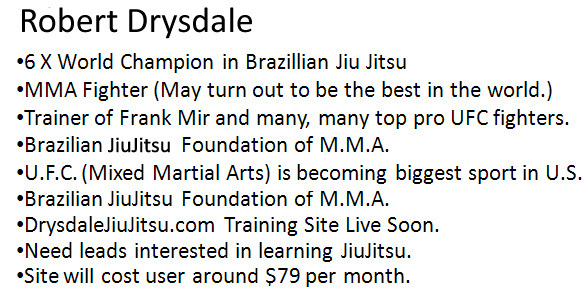 I have been helping my friend Robert Drysdale with his new site where you can learn to do Jiu Jitsu online. Here is some info about Robert on my first slide. I spoke in detail with Sean Rigo, Robert’s business partner on the site. 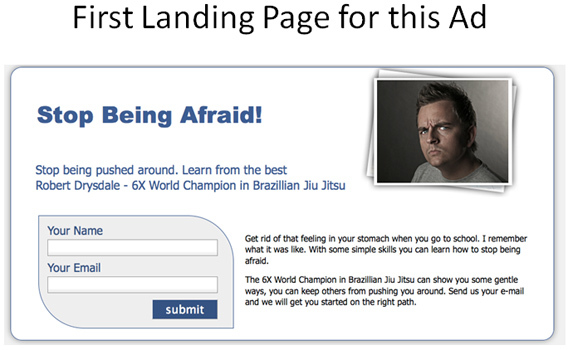 We discussed expectations on the site, and agreed that if we could get quality people to visit the site, who were interested in learning jiu jitsu online, for $10 each we could probably make it work. The site is not live yet, so this is only a guess. Initially just put up landing pages, whose templates had worked before, but with new text and images. The initial goal here was to find an image, title and ad text that would lead to at least some clicks as a starting point. We then tried many different ads with different demographics to see what we could discover. This would lead to the starting ad and demographics. 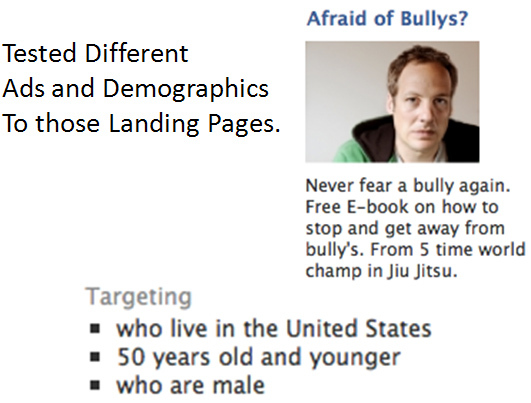 Then I came up with more ads with different demographics that we tested. 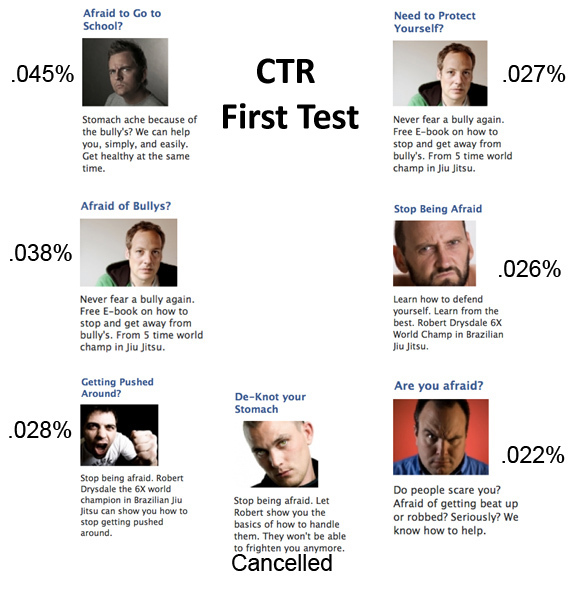 The CTR is the percentage of people who saw the ad, that clicked on it. We used that as a first indication of an ad that made people interested. 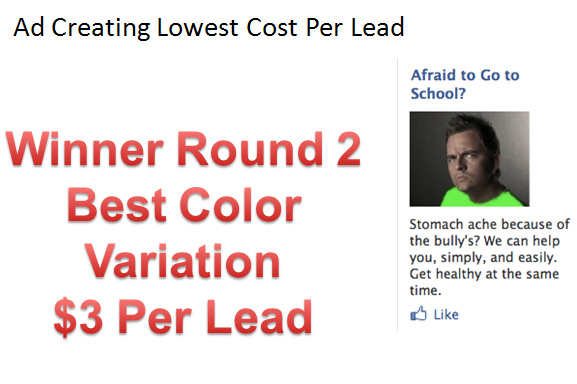 The final ad that says De-Knot your stomach got almost no clicks, and Facebook stopped showing it. One of my staff thought the guy looked hot, so I imediately killed that ad! 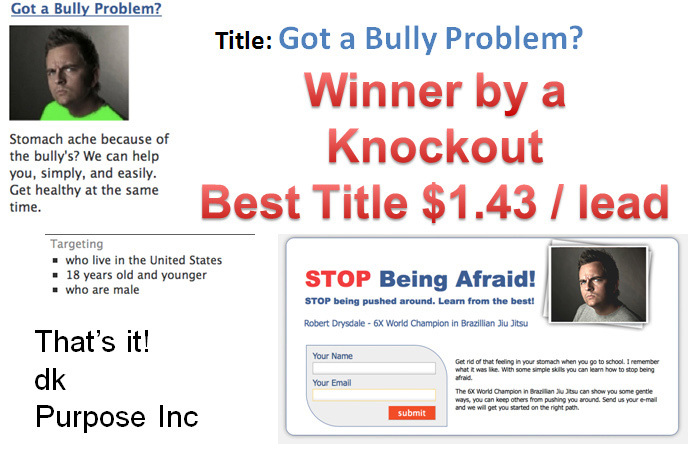 The winner of the first round of testing was, “Afraid to Go to School” At $0.29 per click, it was in the ball park for traffic we might be able to work with. 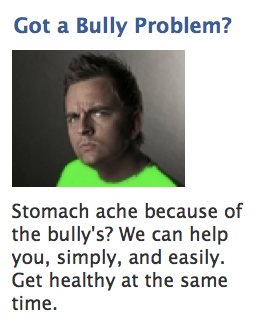 This had a grammar error in it, Bully’­s instead of Bullys. It worked with the grammar error, so we left it. Now it was time to test for better landing pages. Without the site live, I preferred to get the traffic as inexpensively as possible, and verify the users were actually interested enough to at least give up some of their personal data. So we kept going with the testing. 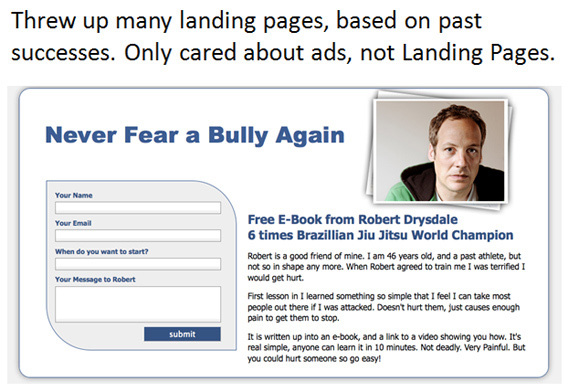 We had made the following landing page when we first made the Bullys ad. No special thought had been used to make the page, but instead was made based on successful templates we had used in the past. The ads were written from the mindset of a kid who is afraid of going to school. When I was a kid, I went to Sun Valley Junior High in Los Angeles where there were gangs, drugs and bullies. This meant that I have firsthand knowledge of being a bit scared of going to school! 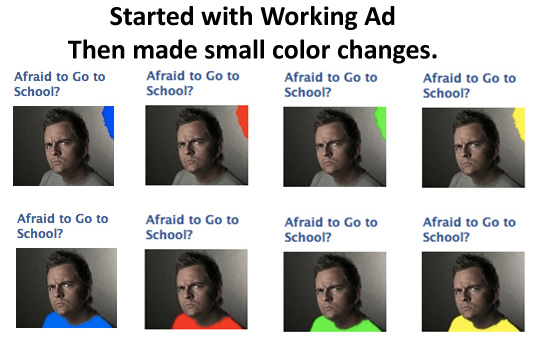 We started with the ad that was already working and decided to test color changes. We could have tested any variable on the ad. 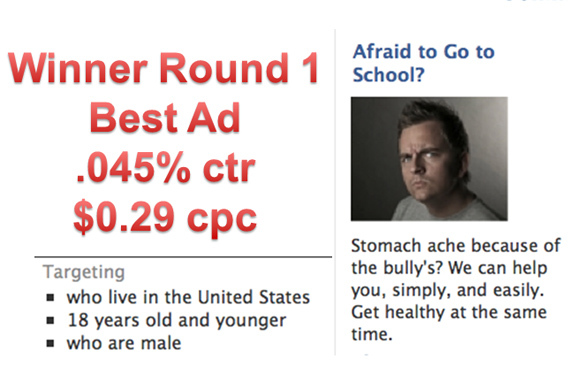 We used the same landing page for each of the following ads. 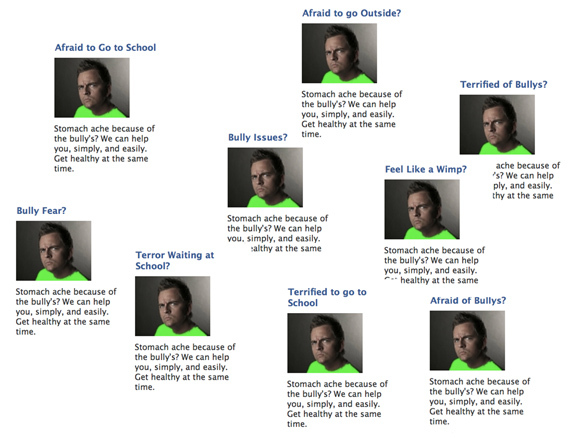 We then changed blotches of color, and the color of the shirt of the bully. 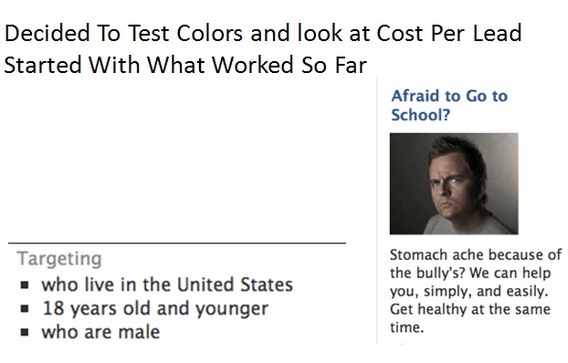 At this point we switched over to measuring the tests by the cost per lead generated. 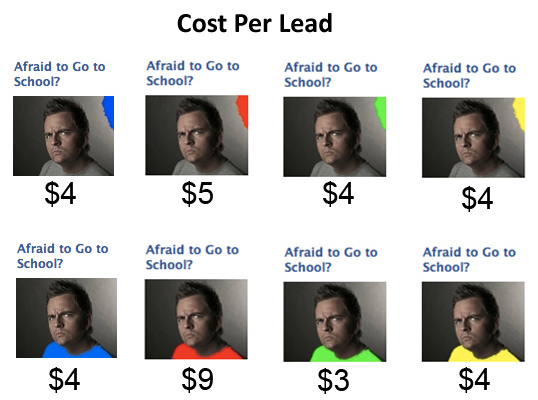 The costs per lead generated varied from $3 to $9. We used tests of 50 clicks or more. It is possible the $3 and $4 ads really had the same result, and it was just random chance. Going onward using the green shirt $3 lead was a safe bet. The Ad (including title, image, and ad copy), the demographics, and landing page together make up what I call the ADL (Ad, Demographic, Landing page). Remember you read A.D.L. here first on John Chow’s blog! 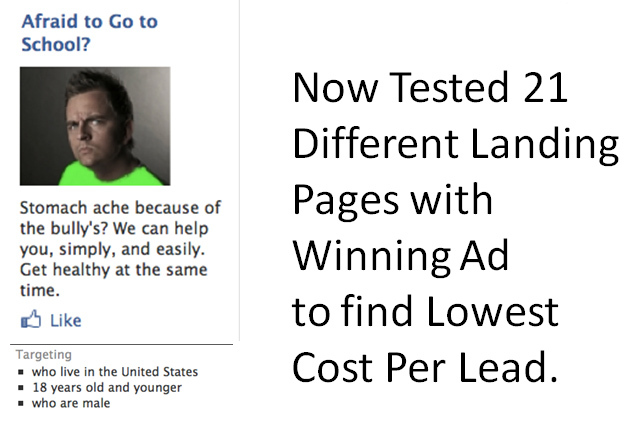 Now that we had a decent ADL, (Ad, Demographic and Landing page) we wanted to see if we could lower the cost per lead by improving on the landing page. At this point I turned the landing pages on as I sat down to watch Avatar. This means the ads were going to run at night, which often yields a different result than during the day. 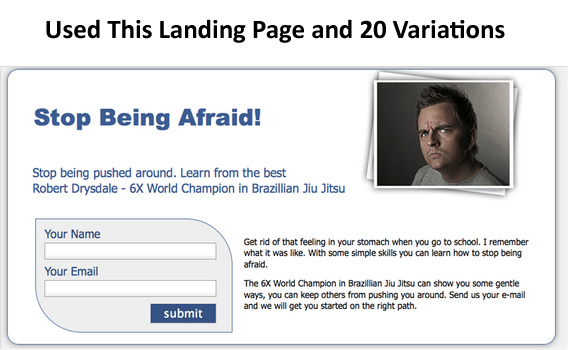 We started with the landing page we had used in the initial test. We then did variations of that. Here Mihai made the title totally red. The orange submit button comes from Shoemoney’s research that orange submit buttons often work best. You never know what works, so you try whatever sounds interesting. The downside of course of having a non native English speaker choose the text of the ads can have results like the one below. 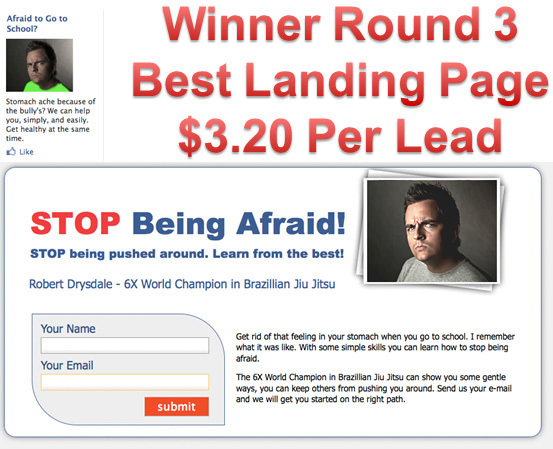 The winning landing page gave us leads at $3.20 per lead. This was more expensive than earlier ads, which I think was because these ads were run at night, and had a lower fill in rate. Now we had a decent ADL, (Ad, Demographic and Landing page). 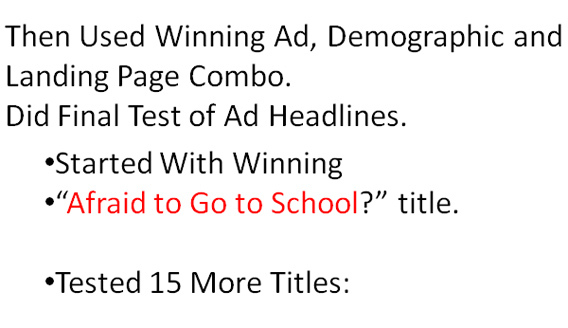 We then tested new ad headlines to see what changes this would yield. There is no correct order to test in. You can go on and on like this, forever, or start completely over with a new concept. 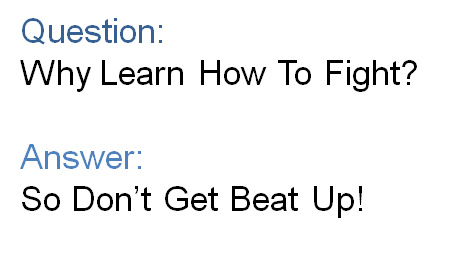 Remember this was all based on the thought that people learn to fight to prevent getting their butts kicked. 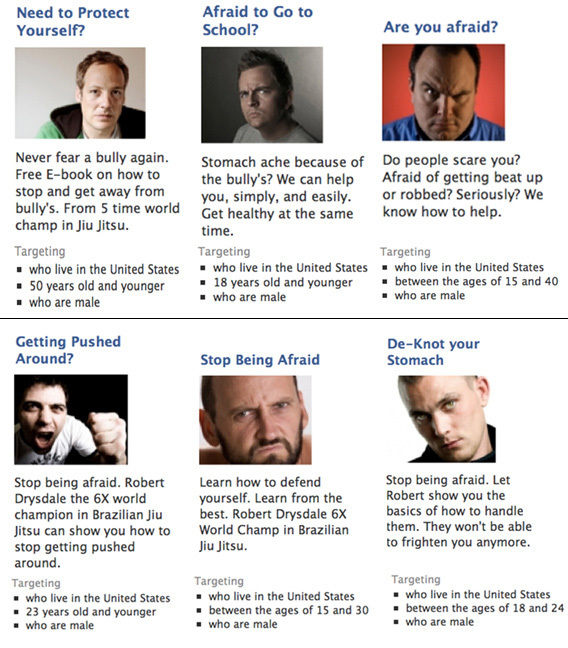 We could have just as easily started with doing Jiu Jitsu to get stronger, improve balance, enhance self defense, get ready to get into the UFC, or a million other ideas. Another important thing we can test is what my co-speaker Mark Colacioppo CEO of Globalizer said, that you can test running the ads just during certain times of the day, and see when they perform the best. We then tested 15 different titles on the ads, while keeping the rest of the ADL (Ad, Demographic and Landing page the same.) I honestly came up with these different titles in about 3 minutes, asking my staff who happened to be standing around me for any ideas they had. We now had an ADL, (Ad, Demographic, and Landing page) that got us leads at $1.43 per lead. So, no more fear for me! I had a success to present! 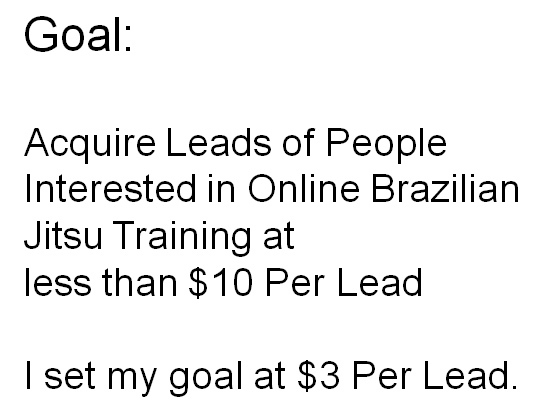 When the site goes live, we will be able to test these leads, and see if this is profitable. Whether it is or not, we will be back testing, testing and more testing to find the lowest possible cost per quality lead, and ultimately the greatest return on investment. If you have facebook questions, just send an e-mail to me, dk or hit me up on twitter. Those of us who get to read John’s blog are very lucky. If you read between the lines, you will see a story of a guy who comes from very humble beginnings, who worked very, very hard, studied hard, and pulled himself up to the top. John’s life is a fantastic and inspirational story that never says, why me?, but instead just pushes forward hard to success. It is a story that cuts across generations, cultures and languages. It is a story that is still being written! John, thank you very much for letting me post this on your blog. I am very honored. Download our printable product brochure for a quick overview of eMerchant's products, services and pricing. This PDF brochure helps you to understand all of our offerings.